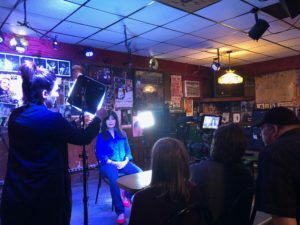 In May, we added another segment to our documentary-in-production, Be the Beauty, when we had the remarkable privilege of interviewing indigenous poet and musician Joy Harjo. Joy, a member of the Muscogee Nation, is the winner of multiple awards including the 2017 Ruth Lilly Poetry Prize, the 2016 Griffin Poetry Prize 2016 for her most recent book of poems, Conflict Resolution for Holy Beings, the Lifetime Achievement Award from the Native Writers Circle of the Americas, the Wallace Stevens Award from the Academy of American Poets, the William Carlos Williams Award from the Poetry Society of America, and many others. 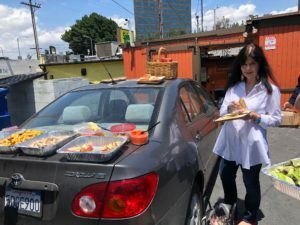 Arriving in Los Angeles for a day of poetry, music, food, fun, and Joy-ful connection, Joy Harjo wears the mantle of her official honors lightly. Vital and beautiful in her late sixties, she focuses her energy instead on all the work that needs to be done to continue to address urgent political themes, to honor tradition and embrace remembrance of her vibrant cultural heritage, and to engage daily with the transformational aspects of poetry. 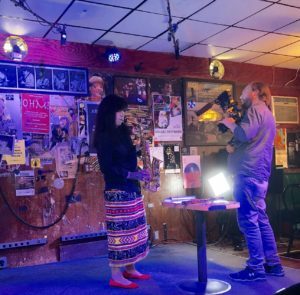 We interviewed Joy at the famed Baked Potato Jazz Club in Studio City, LA, which our Director of Production Ron Singer knew would be a perfect backdrop for the powerful musical and poetry selections she performed on flute, saxophone, and in full-throated voice. As always in her interviews, Joy took each question we asked her to a place of thoughtful contemplation. Some of her answers were like poems themselves as she wove stories of her past, her cultural history, and her profoundly spiritual response to the world into a braid of connectivity. This isn’t the first time during one of our interviews that crew members who were not poets themselves (nor poetry readers) came up to us afterward to say that the day had changed something for them. With that unique alchemy that belongs to the best of the art, poetry speaks louder than words. I was once again so moved to watch the way that Joy’s work and Joy’s spirit in her work, as with the other fine poets we’ve interviewed, reached past benign indifference to wake someone up to new possibilities in the course of a work-a-day afternoon. 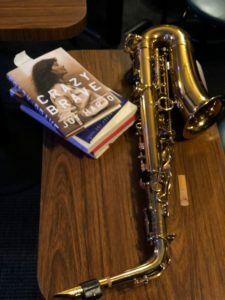 It was especially exciting to hear Joy’s serious yet playful songs, performed on instruments that serve as additional voices for her, in the setting of a jazz club she knew well. We ended the recording session with an impromptu “poetry tailgating party,” with the delicious food we’d had prepared for the shoot served on cars behind the venue! I can’t wait to share more of Joy’s gift and spirit with all of you when Be the Beauty finishes production and post in late 2019!